The Samsung Galaxy S10 release is coming early next year and here’s everything you need to know. From rumors of three screen sizes and even a Galaxy S10+ with five cameras. These exciting new phones will be the 10th-anniversary edition of Samsung’s Galaxy smartphones. Similar to Apple’s popular iPhone X, we’re expecting something truly impressive from Samsung in 2019. While the Galaxy S9 has a lot to offer, expect Samsung to have a few tricks up its sleeve and a bold new design. It’s a milestone year so expect big things. These S10 handsets will compete with three new iPhones from Apple coming later this fall, and will likely have some exciting new features to look forward to. These are some of the leaks, rumors and features. Last month a report came out saying Samsung will release three different Galaxy S10 phones. Three phones with codenames of Beyond 0, Beyond 1, and Beyond 2. A flat 5.8-inch screen, a curved model, and the bigger 6.2-inch Galaxy S10+. Now, we’re hearing information about the fingerprint scanner, cameras, and screens for all three phones. Recent leaks from Korea suggest the Galaxy S10+ will come with five cameras. Not three or four, but five cameras total. Three on the back and two on the front. 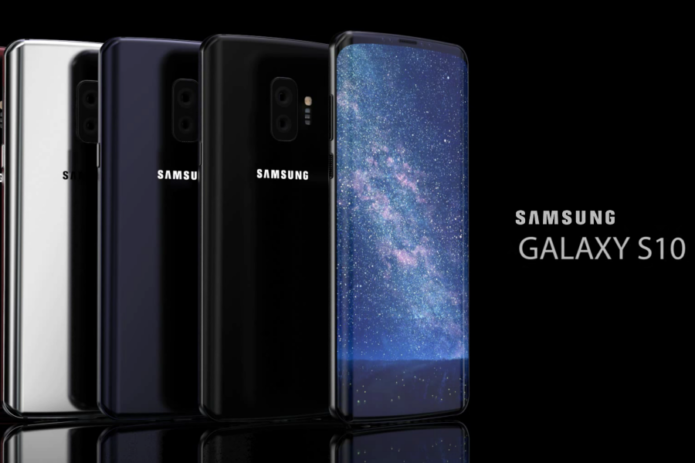 Industry parts experts claim that only the bigger Galaxy 10+ will get this treatment, while the two smaller S10 variants will only have three or four. In the back, Samsung will have two 12 DualPixel cameras like we’ve seen in the past, but then a third sensor. Those being regular wide-angle as like usual, a telephoto zoom lens, then a third ultra wide-angle similar to what we’ve seen from LG phones. Additionally, the report says they’ll use two cameras on the front as well. The main 8MP and a secondary zoom (and depth for portrait photos) 16MP camera. Yes, that’s five cameras on the new and improved bigger Galaxy S10+ coming in early 2019. For what it’s worth, we’re hearing the LG V40 could have five cameras too. And finally, another Galaxy S10 rumor claims Samsung will ditch the Iris scanner and opt for 3D facial recognition. If that’s not enough, the report says 2019 is also the year Samsung will embed a fingerprint scanner into the display, similar to the Vivo NEX. All those “under display” fingerprint sensor rumors are finally coming to fruition. However, Samsung’s Galaxy S10 will reportedly be the first phone with Qualcomm’s in-display scanner technology. That’s important because Qualcomm’s tech works through glass, metal, ceramic, underwater, and is the most advanced option on the market. Keep in mind that we’re hearing the cheaper flat 5.8-inch S10 will have a side-mounted scanner, while the main S10 and Galaxy S10+ will have fingerprint sensors under the screen. On July 5th popular leakster Ice Universe posted on Twitter that the Galaxy S10 will get announced at Mobile World Congress in February. While that’s no surprise, the mention of a Galaxy X release at CES in January was quite interesting. That device will have a foldable screen, and be special, but it won’t replace the flagship Galaxy S10. We could go on and on about a sleek new design, talk about the big curved AMOLED displays, or explain all of the specs, but none of that really matters. The Galaxy S10 and S10+ will be Samsung biggest, fastest, and best phones ever released. We don’t know what it’ll look like yet, so we’ll save that for later. You can bet that they’ll slim down the bezels considerably, and hopefully, Samsung doesn’t copy the iPhone X notch. What’s important is that rumors suggest Samsung will release three phones this year, one will have triple cameras, and they’ve combined years of R&D into a 10th-anniversary flagship Galaxy S10. For the past four years Samsung has released two phones, then a bigger Galaxy Note later in the year. For 2019 it sounds like they’re going to offer an affordable flat-screen Galaxy S10 for everyone that hates curved screens, then two more Galaxy S10 phones similar to what everyone knows and loves. The bigger Galaxy S10+ will have the iconic curved 6.2-inch Quad (or 4K) AMOLED display, a bigger battery, and a unique triple camera system on the back. It’s still early, but here are some potential specs for Samsung’s new phones in February of 2019. We know the Galaxy S10 and S10 Plus will be great, so your biggest question is likely “When can I buy the Galaxy S10?”. If 2019 is like almost every other year, the company will host its annual Samsung Unpacked 2019 event in Spain at Mobile World Congress near the end of February. Basically, expect Samsung to debut and show off the Galaxy S10 around February 25-28th, 2019, at the MWC 2019 tradeshow. Being it’s 10th-anniversary, they could host a big separate event on the 24th. As for when you’ll be able to buy the S10, it should officially hit store shelves a few weeks later. Based on previous years, look for a March 15th, 2019 release date. A popular leakster who often shares exact release info recently claimed the Galaxy X (Foldable phone) is coming in January at CES, followed by the Galaxy S10 in February at MWC. Essentially confirming what we said above. With rumors suggesting three Galaxy S10 phones in 2019, Samsung could really shake up its pricing strategy. Especially if the regular flat Galaxy S10 wants to compete with Apple’s budget iPhone 11. Devices like the Galaxy S8 and Galaxy S9 came in at $720, while the bigger Galaxy S8+ and S9+ are around $850 or so. My guess is the budget Galaxy S10 (flat screen) will cost roughly $650, with the curved Galaxy S10 costing $720-$749. Then, the high-end triple camera Galaxy S10+ might be around $849 or more. Although $899 makes more sense when you compare it to something like the Galaxy Note 8 and Note 9. In closing, we want to share a few other Galaxy S10 leaks, rumors and news for potential buyers. And while we’ve heard a few reports about a design change, we’ll have to wait and see. Just like Apple, Samsung continues to stick to a familiar design. Is 2019 the year they switch it up and offer a completely revamped phone for its 10th anniversary? Next, the popular leakster @IceUniverse on Twitter suggests Samsung’s new phones will get a big boost in performance thanks to faster processors, RAM, and storage. Basically, Samsung’s using faster LPDDR5 RAM and UFS3.0 storage chips that will make apps fly and improve performance as a whole. Combine that with Android 9.0 P and things are getting exciting. Additionally, earlier this year Samsung’s chief hinted at a name change but we’re not sure they’ll ever drop the “Galaxy” moniker. And if they don’t drop the name, they could drop the bigger “Plus” model. A report from Korea believes Samsung will ditch the Plus with the Galaxy S11 in 2020, as the bigger model eats into the Note market share. Thoughts? Before we go, take a look at this awesome Galaxy S10 concept image. And finally, there’s a small possibility the Galaxy S10 will come with a sizable upgrade to the battery for the first time in several years. We’re hearing Samsung will throw a huge 3,850 or 4,000 mAh battery in the Galaxy Note 9. If they do, expect a sizeable increase for the popular Galaxy S series in early 2019 too. Stay tuned right here for any and all S10 information.